Do you breathe through your mouth? Have you ever woken up with an incredibly dry mouth with a bad taste in it? Maybe you don’t know, but your spouse might because they can hear it. Breathing with your mouth open can not only cause noise and snoring during sleep, but did you know it puts you at a higher risk for tooth decay? Mouth breathing can cause various complications in your overall health and your oral health. Keep reading to learn why mouth breathing can lead to tooth decay from a trusted dentist in Melbourne. 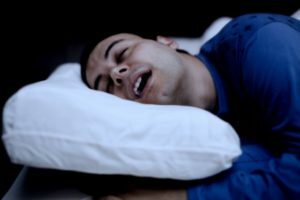 Why Does Mouth Breathing Cause Tooth Decay? The main reason for this unfortunate link between mouth breathing and tooth decay is saliva. Your spit, or saliva plays a key role in preventing cavities. Your saliva actually limits the growth of cavity-causing bacteria. Because mouth breathing dries out your mouth, saliva isn’t there to clean out bacteria, which turns into acid that erodes your tooth enamel. Studies have shown that your teeth lose its minerals when pH levels drop below 5.5 and participants in a mouth breathing study exhibited pH levels around 3.6. This is a high level of acid living in your mouth that will erode enamel, cause tooth decay, and other oral health issues. What Are Some Symptoms of Tooth Decay? If you’re experiencing any of these symptoms, talk to your local dentist to see what the problem is. If the cause of these signs is something other than mouth breathing, you’ll want to know so you can take the proper steps in getting healthy. If your dentist decides you have these symptoms from breathing through the mouth, they may suggest various treatments to help you breathe correctly, especially during sleep. Don’t let these symptoms fester because they will only cost you more time, money, and discomfort down the road. However, if your teeth’s structure is damaged by serious decay, your family dentist in Melbourne has various restorative treatments to get your smile back in shape! Dr. Beverly Rose has been in private practice in Melbourne since 1996. She takes pride in helping patients achieve their smile goals and feel better in her home state. Through continuing education courses, she remains up-to-date on all the latest and greatest dental practices. She takes special care to examine her patient’s smiles for tooth decay and what may be causing it. She can be contacted through her website or by phone at (321) 259-4666 for any questions.